The 23rd psalm is to the life of faith what mac and cheese is to comfort food. Its 110 words are familiar, even beloved. Most folks can recall at least the first verse, and if prompted can probably stumble through all six of them. The 23rd Psalm is a perennial favorite at funerals, covering grief with a warm blanket of hopeful, familiar words. 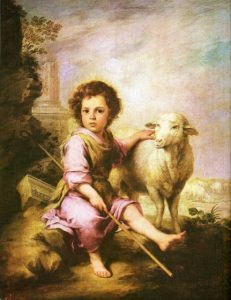 And yet, on this fourth Sunday of Easter–what the liturgical church refers to as “Good Shepherd Sunday” because of the gospel reading (John 10:11-18) in which Jesus refers to himself as the Good Shepherd–we might do well to consider what this psalm means in the context of our daily faith walk. We know from the gospel that Jesus lays down his life for his sheep and that his sheep know him and his voice. Further we hear that there will be one flock and one shepherd (vs. 16b), as Jesus continues to draw the circle larger and include all the wandering and wayfaring sheep. This psalm can serve to amplify what it means to be under the care of the Good Shepherd, to live a life where there is not want. It’s countercultural, this concept of having no want. After all, our consumer culture cultivates (or tries to) an ever-increasing sense of want in our lives, convincing us that we must have more in order to be satisfied. However this absence of “want” in Psalm 23 goes far beyond satisfying our consumer appetites, it exceeds mere daily bread, too. To not “want” means to be content in the daily walk of following Jesus. Whether one finds much a needed, albeit temporary, rest in green pastures, or is struggling through one of life’s inevitable dark valleys, the promise and reality is still the Good Shepherd’s leading and provision. This psalm is no sentimental gaze at a Bartolome Esteban Murillo painting of “Christ the Good Shepherd,” and we who preach and teach dare not let it slip into any such nostalgic or happy-go-lucky realm. To follow Christ the Good Shepherd means to tread through life in the rutted “right path” tracks of righteousness. It’s no easy-peasy short cut to wealth and happiness but rather following in the footsteps of the one who defines right relationship and justice and beloved community. The right path of righteousness doesn’t lead to a pot of gold over the rainbow but rather to a cross and being willing to lay down everything, even one’s own life. Yes, there is comfort in the rod and staff that keeps us headed in the right direction. There are still waters that restore one’s soul. There are glimpses of goodness and portions of mercy filling life to overflowing abundance, and yes there is a place at Christ’s table where we can feast in the presence of beloved community and enemy alike. The Good Shepherd will not forsake us or leave us, but following him means being nimble of foot and sure of step as we keep our eyes and focus on his direction and path. We dare not weigh ourselves down with the cares of the world or fail to love others with the same lavish love that Christ the Good Shepherd extends to us. The journey outlined in the 23rd psalm is not one to be taken lightly but is one that can be undertaken by all who would love the Lord. Blessings for the journey where goodness and mercy are right behind you all the way. 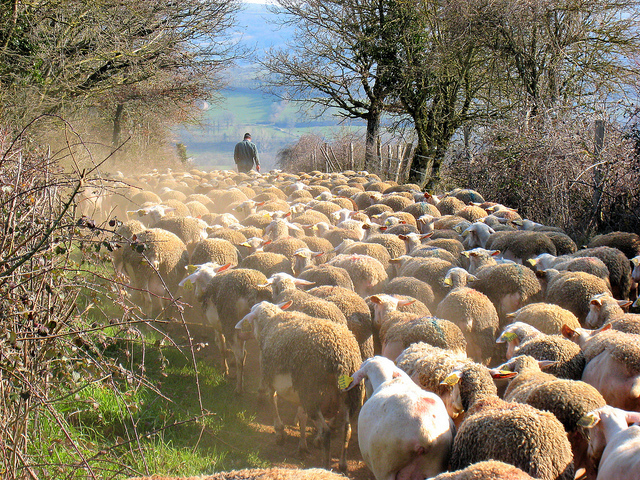 Check out the story of James Rebanks, a modern-day, Oxford-educated, Twitter-savvy shepherd in the UK whose family has a 600-year-0ld history on the land. The article features a lovely short video you might want to show during worship. His new book, The Shepherd’s Life: Modern Dispatches from an Ancient Landscape, is garnering excellent reviews. What does it mean to “not want” in a land of plenty like the United States? Invite youth to contemplate scarcity and abundance. Consider this article about scarcity in the the land of plenty from 2006. What has changed? What still needs to change? What might walking in the paths of righteousness have to do with ensuring that all people have enough, that justice happens? How do we hear Jesus today? Children will have some good answers—and some creative ones, too. Remind them that we learn to hear Jesus’ voice in scripture, through teaching and preaching, and in prayer. We have to learn to listen, and the best way to start is to pray that God will help us learn to have both listening ears and listening hearts. Dearest Jesus, I want to learn to listen for your voice and follow you every day of my life. Help me to listen to you. Help me to follow you. Help me to share your good news with others. I love you, Jesus, and I’m so glad you love me. Amen. Photos: Joan Campderros i Canas, Bartolome Esteban Murillo, and Cee Bee, Creative Commons. Thanks!